While making arrangements for my vacation, friends would ask what I was planning. "I'm going to St. Paul, Minnesota and Montgomery, Alabama," I would say. This would invariably bring a strange look from the other party, followed with a confused "Why? ", or, in one case, "Uhm, those aren't exactly classic vacation get-away spots." To these I would answer, "F. Scott Fitzgerald was an influence on me as a writer. He was from St. Paul, and his wife, Zelda, was from Montgomery. I'm going to see sites related to them." On hearing this, it would inevitably bring a broad smile from these now-converted skeptics, and "That sounds very interesting." There seems to be a certain allure to the notion of treks of this sort. Everyone has a ‘famous favorite', be it a person, event, or item, that brings a particular and preferred appeal. And there are always locales associated with these, because places are ‘where things happen'. It can be a studio where great art was created, perhaps a factory that manufactured revolutionary and stylish products, or an open field where an epic battle once occurred. To see these revered locations creates an associative bond between the ‘enthusiast' and the ‘interest'. To walk along the streets where someone once went about their daily activities, or see equipment used, helps in some ways to understand, and provide an insight. It is living history. St. Paul and Montgomery are both charming cities, and the capitols of their respective states. While not necessarily close, they are largely in-line with one another, and it is possible to see both quite easily while making a ‘loop'. The trip was a memorable one, for all the right reasons. Ride along on this ‘Fitzgeraldesque Journey'. First, however, to understand the motivation for the trip, one must first have occasion to meet the renowned characters who inspired it. Francis Scott Key Fitzgerald was born on September 24, 1896, the third child yet first son to Edward and Mollie Fitzgerald. Scott, as he was known, was born in a row house at 481 Laurel Avenue in St. Paul. Scott had two older sisters, both of whom tragically passed away at young ages shortly before his birth due to an influenza epidemic. 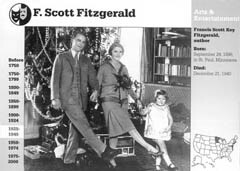 Scott's line of the Fitzgerald family hailed from a farm outside of Rockville, Maryland, and Edward worked as a salesman with Procter and Gamble. Mollie was from the McQuillan family, and her father had established himself as a prominent, astute, and highly successful businessman in St. Paul; the McQuillans were also related to Francis Scott Key (for whom Scott is named), the composer of the United States' National Anthem, "The Star Spangled Banner". A younger sister, Annabel, followed in 1901, and the family resided in St. Paul aside from a ten-year period in Buffalo and Syracuse, New York where they relocated due to Edward's employment. Fitzgerald was educated at The St. Paul Academy, the Newton School, and then Princeton University. Like all young and able men of his age, he enlisted in to the Army during World War 1, being commissioned as a Second Lieutenant, and stationed for a time at Camp Sheridan, outside of Montgomery Alabama, while awaiting his overseas orders. Scott had enjoyed writing from an early age. 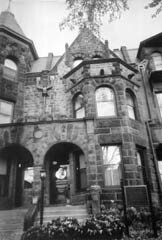 His first published story appears in September 1909, ‘The Mystery of the Raymond Mortgage' in The St. Paul Academy ‘Now and Then'. In August 1911, his first play, "The Girl from Lazy J" is staged in St. Paul, and his first short story sale comes with ‘Babe In The Woods', published in the September 1919 issue of ‘The Smart Set'. Scott wrote his first novel in 1918, whose manuscript was titled "The Romantic Egoist" and ultimately appeared as "This Side of Paradise" on March 26 1920 when published by Charles Scribner's Sons. Scott went on to be a highly prolific author, penning several short stories that ran in ‘The Smart Set', ‘The Saturday Evening Post', ‘Esquire', and other leading magazines, in addition to four other novels and short-story collections. Several of his stories were adapted for both stage and screen; his short story ‘Head and Shoulders' was his first to become a movie, released as "The Chorus Girl's Romance" in 1920, a silent film by the Metro Pictures Corporation starring Viola Dana. Fitzgerald wrote the screenplay "Lipstick" in 1927, which went un-produced, as did "The Red-Headed Woman", written in 1931. Towever, during the late 1930's, Fitzgerald participated as a screenwriter for a variety of films while under contract for MGM. "Three Comrades" was the only film project where he received an on-screen writing credit, for his script adaptation of an Eric Remarque war novel, and this went on to be named one of the ten best films of 1938. His work "The Great Gatsby" (originally titled ‘Trimalchio') was published in 1925 and went on to become a hallmark of twentieth century literature. Actually, two of his books, "The Great Gatsby" and "Tender is the Night" appeared on the ‘100 Best English Language Novels' list as reported by the New York Times – "Gatsby" even took the Number 2 spot behind "Ulysses" by James Joyce. Fitzgerald is fondly remembered for his romantic eloquence, and referred to as "the voice of the lost generation" and "the chronicler of the Jazz Age". 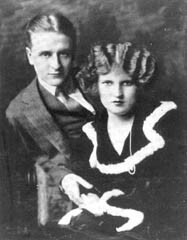 Like most highly creative individuals, Fitzgerald had an ongoing battle with excessive drinking, and passed away suddenly from a heart attack on December 21, 1940 in Hollywood, while working on his final and ultimately unfinished novel, "The Love of The Last Tycoon". This novel was published in 1941, and his final short story, ‘The Last Kiss', was written in 1940 and published in an April 1949 edition of ‘Collier's'. Zelda Sayre was born on July 24, 1900, in Montgomery, being the sixth and youngest child to Judge Anthony D. Sayre and his wife, Minnie. Zelda was born in the family home on South Street. The Sayre Family itself had strong roots in Montgomery, and were certainly part of the city's aristocracy, with a street being named for them in addition to the impressive home of an earlier relative serving as the first White House of the Confederacy. Zelda was a rambunctious, happy child who was free-spirited. She grew up to have a quick wit and diverse interests, in addition to being a captivatingly beautiful woman. She was voted as the "Prettiest" girl in her high school graduating class. Zelda personified the ideal of ‘the Southern Belle', being graceful and flirting with sweet style and ease, winning the attention and adoration of many a beau who squired her around town. Zelda was described as ‘the first Flapper'. To successfully move from being a society debutante to a Flapper is an achievement in and of itself, and proof positive of her astute and extensive social skills. She went on to study ballet, and became an accomplished painter, as well as an author and playwright. Her first published article was ‘Friend Husband's Latest', appearing in The New York Tribune in April 1922 as a satirical review of Scott's newly released novel, "The Beautiful and Damned". Subsequent articles include ‘Eulogy On The Flapper' and ‘Paint and Powder'. Her first and only-published novel, "Save Me The Waltz", appeared in October 1932, and her play ‘Scandalabra' was produced in June 1933. Her artwork eventually grew to an impressive portfolio of boldly colored flowers, nudes, landscapes, a fairy tale and rhyme series, an enthralling self-portrait, and a series of paper dolls for her daughter. Her paintings were exhibited several times, including being featured at The Montgomery Museum of Fine Arts. Another novel, "Ceasar's Things", remained unfinished at the time of her death. Beginning in 1930, Zelda experienced emotional breakdowns and relapses, and passed away due to a fire at the Highland Hospital in Asheville, North Carolina where she was being treated on March 10, 1948. Together, Scott and Zelda made a striking couple. They were both extremely attractive, lively, daring, jovial, fun -- merry pranksters who had a zest for life and boasted a youthful exuberance that buoyed charisma to a ‘t'. They met at a dance at the Montgomery Country Club in July 1918. As a couple, each was seen to be ‘quite a catch' for the other. They were remarkably well-paired, almost ‘perfectly matched' in many respects. Their courtship was fevered and intense, surviving through the somewhat tumultuous times that any true relationship experiences. Scott lovingly referred to her as "a whirlwind" while she affectionately nicknamed him "Goofo". They first became engaged in February 1919, with Zelda ending the betrothal in June due to a concern over being properly supported by a struggling author who possessed bold dreams, but was still making his way in the world of writing. Scott was heartbroken, but steadfast in his desire. Determined, he worked diligently and was employed as a copywriter in Manhattan, then his thrice-revised novel was accepted by Maxwell Perkins, an editor at Scribner's. This paved the way for a renewal of the courtship. In an ultimate act of a romantic coup, Scott won Zelda back. The engagement was revived in November. They were married just before noon on April 3, 1920 in New York City, a week after "This Side of Paradise" debuted on the store shelves. Their daughter, and only child, Frances Scott ‘Scottie' Fitzgerald, was born in St. Paul on October 26, 1921. A particularly dazzling photograph by Alfred Cheney Johnson of Scott and Zelda together was published in the May 1923 edition of ‘Hearst's International' magazine. Scott and Zelda also wrote dual articles, the first being ‘What Became of the Flappers / Our Young Rich Boys' in 1925 (later reprinted as ‘What Became of Our Flappers and Sheiks'), and others including ‘Looking Back Eight Years'. Along similar lines, Zelda's 1932 novel "Save Me The Waltz", is a very well written autobiographical account of their relationship and marriage from her perspective. Scott followed up two years later with his version, "Tender Is The Night" (in reading both together, one is given an interesting perspective in ‘he said vs. she said'). To the world they may have been ‘Great Scott!' and ‘The Flapper Queen', but their ardent admirers should not lose sight of the fact that they were still a man and a woman, as a couple experiencing a relationship which had its own joys and stresses like any other. They had their share of trials and tribulations, and some may say more than their due, but over and above, they had largely more high points than lows. They travelled extensively, being ‘jetsetters', or more rightly, ‘Cat's Meow Nomads'. They enjoyed ‘the good life', riding a wave financed by Scott's highly productive and equally lucrative writing abilities which drew large audiences that in turn commanded high fees. They were unique certainly; plays and films have been written about them, a host of collectibles and memorabilia exist about them, and several biographies and documentaries have been devoted to them to chronicle their exquisite, euphoric existences. There are even an International F. Scott Fitzgerald Literary Conference, and a F. Scott Fitzgerald Society. Scott and Zelda were ultimately laid to rest together in the Fitzgerald family plot at St. Mary's Cemetery in Rockville, Maryland. The epitaph reads as "So we beat on, boats against the current, borne back ceaselessly into the past. ", a quote encompassing the final line of "The Great Gatsby". Both St. Paul and Montgomery commemorate Scott and Zelda Fitzgerald in many noble manners. There is a ‘Fitzgerald Walking Tour' one can do in St. Paul. First, there is the "mecca" for Fitzgerald enthusiasts, 599 Summit Avenue – his family home in 1919 where he did his revisions on "This Side of Paradise". The front room on the third floor served as his writing den. A large historical site plaque is in the front lawn here. Then there is 481 Laurel Avenue, the house where he was born. A small plaque to the left of the front door recognizes the importance of this home. Scott and Zelda lived for a time at the Commodore Hotel at 79 Western Avenue, while awaiting the birth of Scottie in 1921. Following Scottie's arrival, they lived for a time in a large house at 626 Goodrich Avenue. Other important sites include the former Saint Paul Academy at 25 Dale Street (now the Apollo Group Home), where Fitzgerald received his early education; the former Backus' Boarding School at 580 Holly Street where his early plays were performed; and The University Club at 420 Summit and W.A. Frost and Company at 374 Selby where he socialized as a youth. The Charles T. Miller Hospital where Scottie was born no longer exists on Kellogg Boulevard West, though the facility itself is currently United Hospital at 333 North Smith Avenue. To see these and other locations, including the McQuillan homes, takes roughly two hours at a relaxed walking pace. 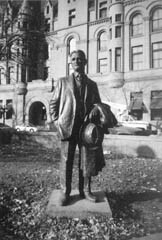 There is a life-size and finely crafted memorial bronze statue to Fitzgerald in Rice Park, at the corner of 5th Street West and Market Street. The plaque accompanying the statue carries a quote from "The Great Gatsby". A circa 1937 photo of Fitzgerald appears in the ‘Minnesota Celebrities' mural on the wall of the St. Paul Hotel Grill at 350 Market Street, across from the Park and its Statue. There is also the Fitzgerald Theatre at 10 East Exchange Street – an elegant entertainment facility originally constructed in 1910 and re-christened in honour of Fitzgerald in 1994. A bust of Scott, one of the early models used to create the statue in Rice Park, adorns the main lobby. There is also the ‘F. Scott Fitzgerald Room' at the Northland Inn Conference Center at 7025 Northland Drive Minneapolis. Fitzgerald statue, Rice Park, St. Paul, Minn. In Montgomery, Zelda's childhood home no longer stands, though it is easy enough to find the lot that is the former location of 6 Pleasant Avenue, just to the south of the southwest corner of Pleasant and Mildred Street, only two blocks away from Sayre Street. Then there is Sidney Lanier Senior High School at 1756 South Court Street, where Zelda attended. The Montgomery Country Club where Scott met Zelda still exists on Narrow Lane Road, though the original Clubhouse was destroyed by fire. The Scott and Zelda Fitzgerald Museum can be found at 919 Felder Avenue in Montgomery. This was a former residence of Scott and Zelda in 1931-32, though at the time they were there the address was 819 Felder. This is the only museum in the world to commemorate Scott and Zelda. There is a large plaque on the street in front of the house, and on the lawn stands a square memorial which was constructed with bricks from Zelda's home at 6 Pleasant Avenue when it was dismantled. The Museum opened on May 5 1989, and is the definitive resource for ‘all things Fitzgerald', displaying several rare and interesting artifacts and being staffed by knowledgeable and courteous representatives of the Scott and Zelda Museum Association. Across the street at 840 Felder is Fitzgerald Park, a quaint and appealing parkette with a fountain and plaque honouring Zelda. Original Zelda paintings are on permanent display at the Montgomery Museum of Fine Arts at One Museum Drive. Montgomery also has Zelda Road. Sidestreets are F. Scott Drive, Gatsby Lane, Fitzgerald Road and Zelda Court as this road meanders between Ann Street and Vaughn Road – there is also the ‘Zelda Place' strip-mall here. Interestingly, there is a Days Inn on Zelda Road, so Fitzgerald enthusiasts can actually stay on the street named for Zelda in her hometown – astounding. The trip was truly enjoyable. It was informative as well. I was able to see everything I wished to see, and had the opportunity to meet interesting and friendly people. I experienced ‘Midwestern Congeniality' along with a healthy dose of ‘Southern Hospitality'. In seeing these sites connected to F. Scott and Zelda, one could imagine the ‘joie de vie' they unabashedly brought to the areas and people there during their lifetime. As for me, it was one small way to pay tribute to a mentor – in a lighthearted yet zestful manner that he and she could hopefully relate to, and understand. As Ever, Ol' Sport. If you would like to talk more about the article, Ian Anthony can be reached at 416-935-6439.